Free hot water with your PV generated power! Energy+ introduces the Power Reducer, the intelligent way to maximize the use of your PV generated power, designed to divert manually or automatically any surplus energy produced by your PV system to a heat store such as the immersion tank. Power Reducer can help you reducing your electricity bills by controlling the amount of energy drawn by the immersion tank and minimizing the imported energy from the grid. 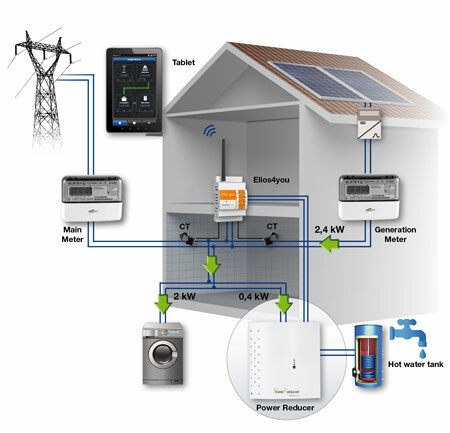 The Power Reducer works by monitoring your PV export and when it sees that you are exporting your free energy it redirects it to your hot water tank or other heating source, ensuring that no additional power is ever imported to supply the hot water store. 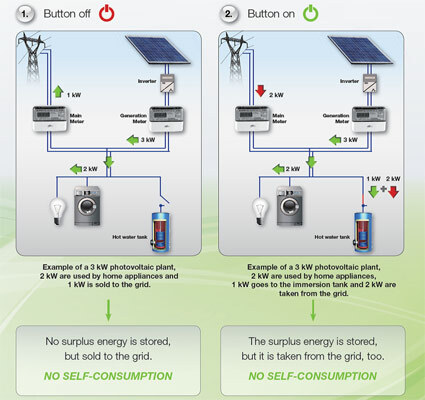 In this way the all available surplus energy is used by maximizing the self-consumption. Example: with a resistive load of 1700 W and having surplus power available for 400 W, the Power Reducer heats the resistive load for 400 W without taken 1300 W from the grid that are necessary to activate it. The diagram shows the Power Reducer that diverts the energy to the immersion tank: here it is managed by Elios4you, enabling complete control and visibility by a dedicated graphical interface, providing valuable reporting tools to aide in reaping the most out of your PV system.